Nowhere to hide now Harris, because if they find you guilty, the whole filthy group will get exposed. Clearly you are a piece of filth, but we will wait on the verdict. Be aware, if you lose, the lot is coming down. 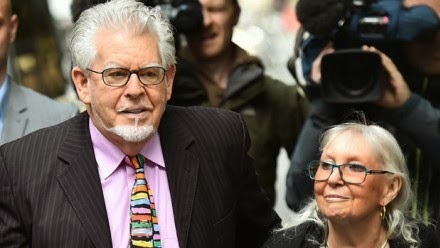 The jury in the trial of Rolf Harris has retired to consider its verdict on 12 charges of indecent assault spanning three decades. During the six-week trial, the 84-year-old entertainer has sung for the jury, shown them how to blow into a didgeridoo and even demonstrated the sound of his famous "wobble board". But the prosecution has reminded him it is "not a talent show" and persuaded him to admit that he has a darker side that allowed him to conceal affairs from his wife. Prosecuting lawyer Sasha Wass has said jurors will need to fathom "how dark that dark side actually is". Judge Justice Sweeney finished his summing up of the evidence this morning. He reminded jurors of the evidence given by alleged victim Tonya Lee, an Australian who waived her right to anonymity. She claimed Harris assaulted her on the first day of a trip to England at a meal in a London pub and that she subsequently lost up to six kilos during the six-week UK tour. However, the defence revealed that she got the dates wrong and that the meal happened at end of the tour. The judge also gave a recap of the evidence given by a mother and daughter who claimed Harris assaulted them both at a DIY shop in Australia in 1991.